Im getting there, slowely but surely. 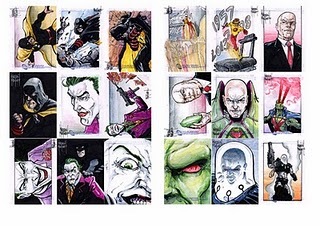 I will get all the sketch card galleries up eventually. The requests do seem to get me more motivated though, so keep them coming in and I will get to tham as soon as I can. I wish it was a little easier, what with all the resizing, copying, pasting & saving, it does take awhile. 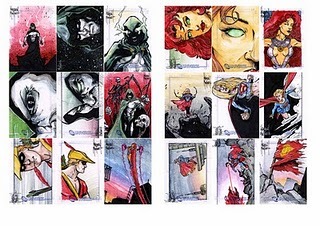 But here it is, the next set up... JLA Archives from DC Comics / Rittenhouse (2009). As I mentioned yesterday, I was scheduled to start working on my website this month and had everything all set up. I even signed on to Squarspace to make it easier for myself, but due to the unexpected workload, the website update just isn't going to happen yet... again. I'm seriously getting frustrated about not getting anytime to do it. I can barely keep up with this blog and I've pretty much given up on following Facebook. ComicSpace was one of the sites that was making it easy for me with getting up scans of my work. They had an awesome layout and gallery section for easy viewing and was very easy to upload. Unfortunately ComicSpace went down hill this year. The site owners didn't seem to be very hands on, spammers started taking over which the moderators seemed to do very little about, and I just stopped visiting. They've just recently updated their entire format. Now, I give them props for trying something new and being present enough to want to move their site forward, but the new site is a complete waste of space. They took out the "easy" from every aspect of what I liked about it and the galleries are next to impossible follow or view with any kind of ease or control. So I gave up on them, deleted all my galleries, (which wasn't easy) and closed my account. Now the plan is to update my website to the way I want it and now add the same type of gallery section that ComicSpace used to have. 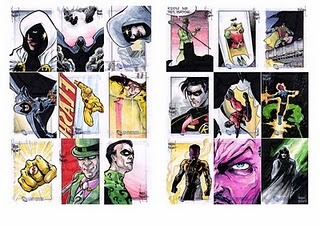 These are all my scans for the DC Legacy set released by Rittenhouse Archives in Sept 07. 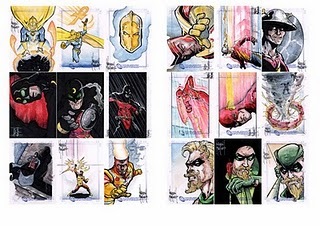 I thought I would post some Artists proof Sketch Cards I did from the recently released Justice League Archives set. 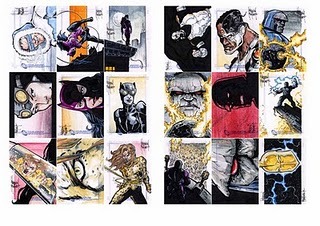 For those of you that don't know what an Artist Proof card is, heres a brief explanation. 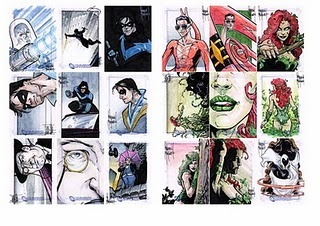 Many card companies now give to their sketch card artists a type of bonus in the form of either a "returned card" or "Artist's Proof' card. 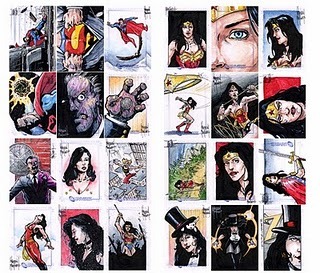 A returned card is a finished sketch card from a set, returned to the artist so they can sell, keep, or do whatever with it. An Artist's Proof card is a separate blank card with special printing or with "Artist's Proof" printed on the back, given to the artist so they can sell, keep, or do whatever with it. It being blank, the artist can draw whatever he wants on it or be commissioned to do a specific subject. Though they usually have to be approved by the company before being sold. 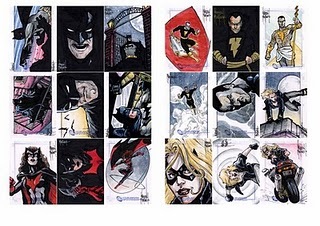 Here are a few JLA Artist's Proof cards I've done recently. 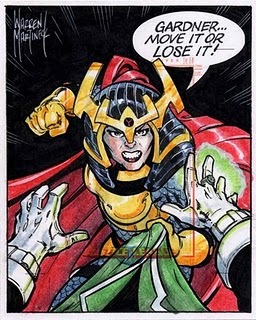 The first is of a certain GL Guy Gardner mistakingly blocking the path of an enraged Big Barda. Not a good idea. 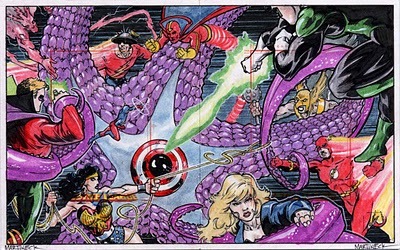 The second is one of the few puzzle AP's I've ever done of some of the members of the JLA and the JSA attacking one of their favorite villains, Starro. 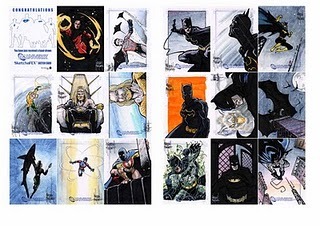 These JLA Artist's proofs don't have any special printing on them, we were just given regular blanks. I do have a few AP's still available if anyone would be interested, just contact me. I've been a busy boy lately with a few commissions kicking around and penciling a fully rendered comic. When I get deep into work like I am now and it becomes a slow news time, I sometimes find I have very little imagination for other things... like what to post on my Blog. Seriously, (pointing to head) there's nothing going on up here! I do so much better when asked a direct question or whatever. I know Casual Friday was a favorite among many of you, but until I get back on or ahead of schedule, I've put that on hold for a bit. So, if there is anything any of you guys would be interested in me talking about, posting, things you'd rather be reading about here, artwork, how to's, my take on life, whatever. Let me know here, or email me. 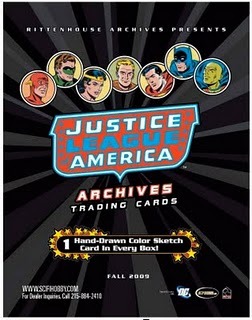 Justice League of America Archive Set Released. 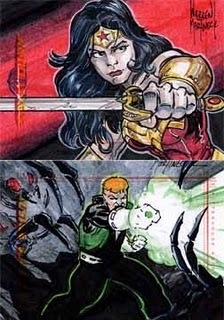 The Justice league of America Card set has now been released and here's some of the pics and info I promised. 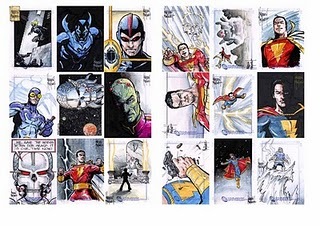 I did 200 full color sketches for the set and I have posted all of them here in a ComicSpace Gallery. I've thrown a few pics here and there to keep you busy. For more info on the set itself, you can go to Rittenhouse's JLA Web page. 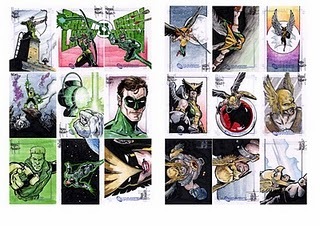 These JLA Team cards make up a 3 card puzzle in which I did enough of each to make it much more possible to complete a set. More on this and a special offer in the next post. up on a lot of things in the studio, and out, that I've been putting off for the last month or 2. This week ripped by and if it wasn't for an email I got today mentioning my Casual Fridays, I would have completely forgotten. But I sat down after dinner, pulled out my portable drawing board, hit the couch, and started working out a wispy sort of spectral figure. 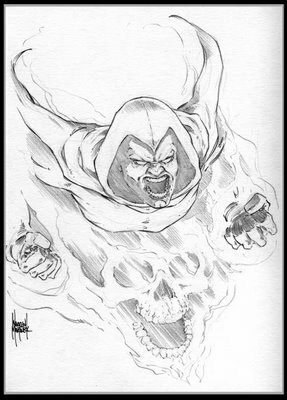 So, here is The Spectre. I've always liked this character, he's really cool to draw and in my head I came up with about 13 different ways or scenes I would liked to have drawn him in. But this "screaming out of the mist" was the first one I went for.